Gillespie was a Whig member of the Illinois Assembly in 1840-41 and then served in the State Senate from 1847 to 1859. He was a Know-Nothing before he joined the Republicans in 1856. 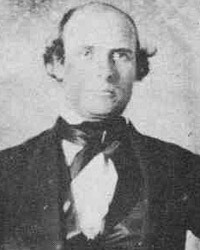 Gillespie chaired the Illinois Republican State Convention in 1860 and served as circuit court judge in Southern Illinois from 1861 to 1873. During his political career, Gillespie often acted as a sounding board for Mr. Lincoln’s political views and aspirations. He was particularly critical in 1849 when Mr. Lincoln was struggling to arrange to get the Land Office job – first for Cyrus Edwards and then for himself. Gillespie was close to Edwards, his legal mentor. Sometimes, Mr. Lincoln seems to be talking to Edwards in his letters to Gillespie. Mr. Lincoln was sensitive to Gillespie’s own political aspirations. He wrote to him in December 1854: “I have really got it into my head to try to be United States Senator; and if I could have your support my chances would be reasonably good. But I know, and acknowledge, that you have as just claims to the place as I have; and therefore I do not ask you to yield to me, if you are thinking of becoming a candidate yourself. If, however, you are not, then I should like to be remembered affectionately by you; and also, to have you make a mark for me with the Anti-Nebraska members, down your way. If you know, and have no objection to tell, let me know whether Trumbull intends to make a push. If he does, I suppose the two men in St. Clair, and one or both in Madison will be for him.”9 Gillespie replied that he found bound to support his legal mentor Cyrus Edwards, but acknowledged: “I would say to you that your claims are equal to those of any man in the State So I have felt and so our People feel I regard the present as a crisis in our political affairs in which forbearance and perhaps a self sacrificing spirit should be prominently displayed by us all By the adoption of judicious councils we may and will be likely to permanently triumph; by the reverse course we must signally fail I shall have more to say when we meet In the mean time receive assurances of my continued regard.”10 Gillespie first voted for hisfriend Cyrus Edwards – before switching to Mr. Lincoln. Gillespie himself told Herndon: “He was very sensitive…where he thought he had failed to meet the expectations of his friends. I remember a case. He was pitted by the Whigs in 1840 to debate with Mr. Douglas, the Democratic champion. Lincoln did not come up to the requirements of the occasion. He was conscious of his failure, and I never saw any man so much distressed. He begged to be permitted to try it again, and was reluctantly indulged; and in the next effort he transcended our highest expectations. I never heard and never expect to hear such a triumphant vindication as he then gave of Whig measures or policy. He never after, to my knowledge, fell below himself.”11 Mr. Lincoln reflected those sentiments when he wrote Gillespie in 1858: “I shall take the stump and do all that lies in my power,”12 He also did all in his power to help Gillespie. Mr. Lincoln had to pick up some of the slack in the Gillespie’s law practice in 1859 when Gillespie was bed-ridden. Joseph Gillespie, Recollections of 40 years, p. 28. William H. Herndon and Jesse W. Weik, Herndon’s Life of Abraham Lincoln, p. 161-162. Paul Simon, Lincoln’s Preparation for Greatness: The Illinois Legislative Years, p. 223. William H. Herndon and Jesse W. Weik, Herndon’s Life of Abraham Lincoln, p. 183. William H. Herndon and Jesse W. Weik, Herndon’s Life of Abraham Lincoln, p. 208. Francis Fisher Browne, The Every-day Life of Abraham Lincoln, p. 241-242. George W. Smith, When Lincoln Came to Egypt, p. 88-90. George W. Smith, When Lincoln Came to Egypt, p. 99. Roy P. Basler, editor, The Collected Works of Abraham Lincoln, Volume II, p. 290 (Letter to Joseph Gillespie, December 1, 1854). Abraham Lincoln Papers at the Library of Congress. Transcribed and Annotated by the Lincoln Studies Center, Knox College. Galesburg, Illinois. (Letter from Joseph Gillespie to Abraham Lincoln1, December 20, 1854). William H. Herndon and Jesse W. Weik, Herndon’s Life of Abraham Lincoln, p. 160. Paul Simon, Lincoln’s Preparation for Greatness: The Illinois Legislative Years, p. 308. Rufus Rockwell Wilson, editor, Intimate Memories of Lincoln, p. 333-334 (Cincinnati Commercial Gazette, 1888). Douglas L. Wilson and Rodney O. Davis, editor, Herndon’s Informants, . Rufus Rockwell Wilson, editor, Intimate Memories of Lincoln, p. 22-23 (Joshua F. Speed). Abraham Lincoln Papers at the Library of Congress. Transcribed and Annotated by the Lincoln Studies Center, Knox College. Galesburg, Illinois. (Letter fFrom Joseph Gillespie to Abraham Lincoln, December 29, 1863). Francis Fisher Browne, The Every-day Life of Abraham Lincoln, p. 168. William H. Herndon and Jesse W. Weik, Herndon’s Life of Abraham Lincoln, p. 277. William H. Herndon and Jesse W. Weik, Herndon’s Life of Abraham Lincoln, p. 351-352. George W. Smith, When Lincoln Came to Egypt, p. 42. Matthew Pinsker, Lincoln’s Sanctuary: Abraham Lincoln and the Soldier’s Home, p. 152.